Growers must make frequent pesticide applications to control spotted-wing drosophila (SWD) during times of high infestation pressure. Unfortunately, these frequent applications, along with the fly’s ability to reproduce rapidly, increase the risk of insecticide resistance. Insecticides with new modes of action will be needed to insure that growers will have the tools they need to protect their fruit crops. 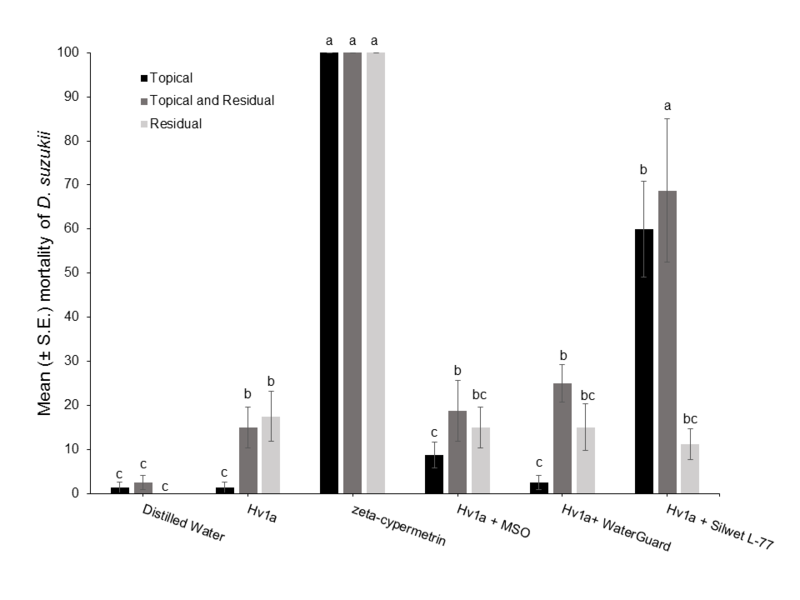 Biopesticides are attractive for their low toxicity to mammals and short post-harvest interval, and little to no detectable residues, thus reducing MRL concerns. However, biopesticides can be inconsistent in their efficacy in trials. Sometimes these materials can be made more effective by combining with adjuvants. Researchers at Michigan State University decided to test one such novel, spider venom-based biopesticide called “Hv1a”, commercially available at T-Spear (Vestaron Corporation) alone and in combination with several adjuvants, to see how well it controlled SWD in blueberries. The MSU researchers started out with a series of experiments in the lab. 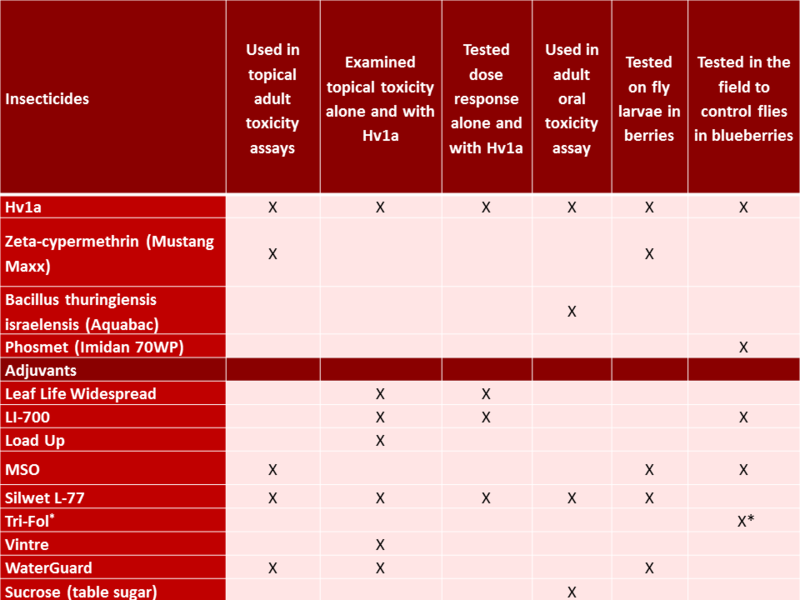 First, they tested topical toxicity of Hv1a and several adjuvants (listed in Table 1) to adult flies. In these experiments, researchers looked at effects if they sprayed the flies directly and tested the materials for residual activity. Zeta-cypremethrin (Mustang Maxx) was included in some of these experiments to compare the Hv1a and Hv1a and adjuvant treatments to a standard insecticide. MSU researchers also examined the topical toxicity of additional adjuvants by themselves and compared those effects to the adjuvants plus Hv1a. Based on the results of these studies, researchers tested how the top three most effective adjuvants affected fly mortality when combined with Hv1a at different doses. Next, they tested oral toxicity to adult flies by feeding them Hv1a alone and Hv1a in combination with a feeding stimulant (sugar), Silwet L-77, or a Bti-based bioinsecticide (Aquabac). To look for effects on immature flies, they tested the toxicity of Hv1a, combined with several adjuvants, on fly larvae in berries. Based on the results from the lab studies, MSU researchers tested the most promising combinations of Hv1a and adjuvants in the field, along with phosmet (Imidan 70WP) as a standard insecticide. Table 1. A list of the experiments performed with Hv1a and the materials used in each experiment. In lab studies, Hv1a plus certain adjuvants performed better than either Hv1a or the adjuvant alone. In the first set of lab assays targeting adult flies, Silwet L-77 worked significantly better than water alone and most other treatments except the standard insecticide, zeta cypermethrin (Fig. 1). Fig. 1. 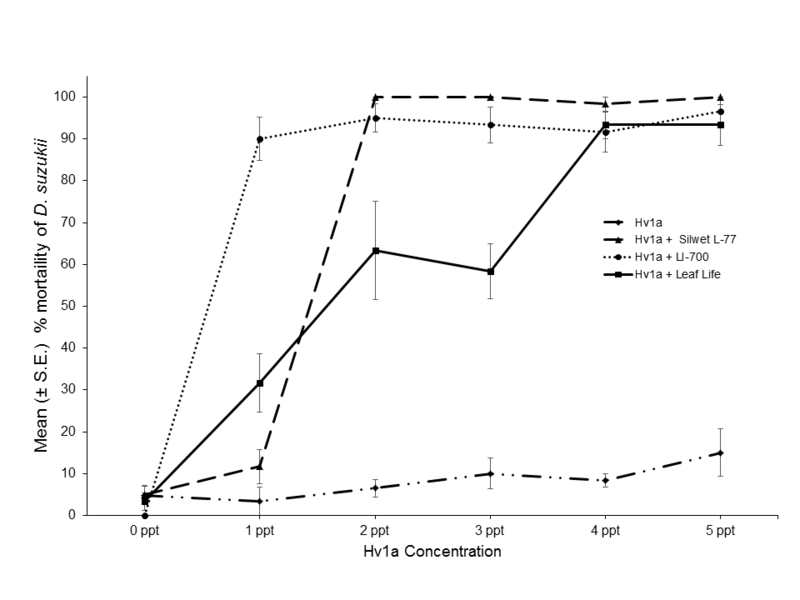 Effect of Hv1a, with and without adjuvants, and zeta-cypermethrin on the mean (±S.E.) mortality of D. suzukii for topical and residual exposure at 72 h after treatment. Means comparisons were made among treatments within the same colored bars, and bars headed with the same letter within an exposure method are not significantly different (P>0.05, ANOVA, Tukey’s HSD test). Source: Fanning et al. 2018. In the second experiment with additional adjuvants, when these two materials along with Silwet L-77 were combined with different doses of Hv1a, all three adjuvant and Hv1a combinations showed increased the mortality over Hv1a alone (Fig. 2). Fig. 2. Effect of adjuvants and different concentrations of Hv1a on the mean (±S.E.) % mortality of adult D. suzukii after 24 h of exposure in topical application bioassay. Source: Fanning et al. 2018. In the oral toxicity adult assays, no combinations of adjuvants (sugar, Aquabac, or Silwet L-77) with Hv1a improved fly mortality (data not shown). 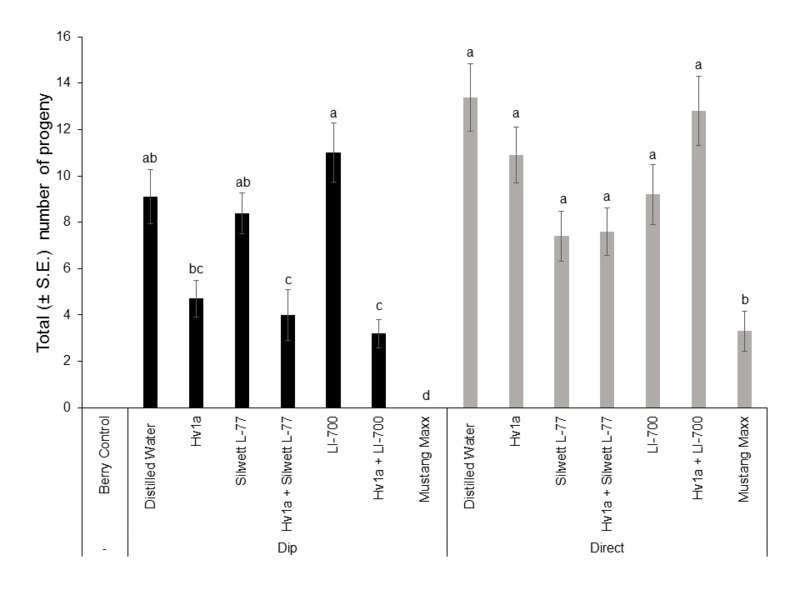 In the larval assays, fruits dipped in Hv1a+Silwet L-77 and Hv1a+L1-700, showed lower larval survival than untreated fruit, but sprays to the fruit with these materials did not reduce larval survival compared to the control (Fig. 3). Fig. 3. Effect of Hv1a, with and without adjuvants, and zeta-cypermethrin on the mean (±S.E.) number of D. suzukii larvae in blueberries. The fruit was treated when the egg and early larval life stages of D. suzukii were present. Means comparisons were made among treatments within the same colored bars, and bars headed with the same letter within an exposure method are not significantly different (P>0.05, ANOVA, Tukey’s HSD test). Source: Fanning et al. 2018. However, it is easy to kill flies in the lab. The question of most relevance to growers is: How does this material work in the field? A field trial was conducted in highbush blueberry over 4 weeks, with weekly applications of treatments. Infestation in fruit was assessed at three times throughout the field trial. In the first assessment field experiment, no treatments differed in larval infestation per berry from the untreated control. However, in the second and third assessments of the trial, all insecticide treatments led to significantly lower larval infestation than the control (Fig. 4). Fig. 4. 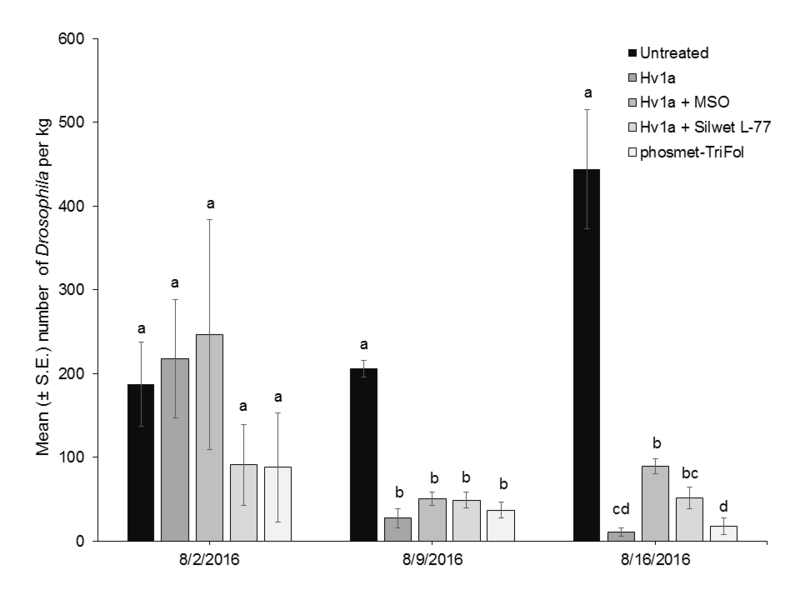 Field performance of Hv1a, with and without adjuvants, and phosmet on the mean (±S.E.) number of D. suzukii larvae in blueberries. Means comparisons were made among treatments within each date, bars headed with the same letter within an exposure method are not significantly different (P>0.05, ANOVA, Tukey’s HSD test). Source: Fanning et al. 2018. Hv1a shows potential as an insecticide with a novel mode of action to use against SWD in blueberries. The material is toxic via contact exposure to adult flies, but is a poor choice for baits as it has little oral toxicity. Lab studies indicate that it can be made more effective by adding certain adjuvants. However, in field trials, Hv1a had similar efficacy to the standard insecticide phosmet with and without adjuvants. Further field testing is needed to determine if this material is suitable for SWD control in other areas or for other crops. Read the whole study here: Fanning PD, A VanWoerkom, JC Wise, R Isaacs. 2018. Assessment of a commercial spider venom peptide against spotted-wing Drosophila and interaction with adjuvants. Journal of Pest Science.